Many of us hand lay track in ON30. It is a slow process but very enjoyable and rewarding. I also made all my turn outs (switches) using the Fast Track template and methods. I have hand laid my rail and built the turnouts since day one. Made a little more progress. I regauged my Bachmann Climax, now I have two locomotives running and two freight cars all gauged to On3. When I get the loop running I am going to go back and get all my locomotives and freight cars gauged to On3 before I go back to layout building. I build one more turnout and a siding. I modified my rail color a little bit, I made the mainline a little darker rust and I made the siding a really dark / dirty rust. the siding will be sunk in the ground with lots of weeds and the ties and rail will be a little harder to see so I did not weather the ties as much as the mainline. When I get more track running I am planning on going back and do 4 spikes for every tie, that's right, every tie, I like the way it looks. 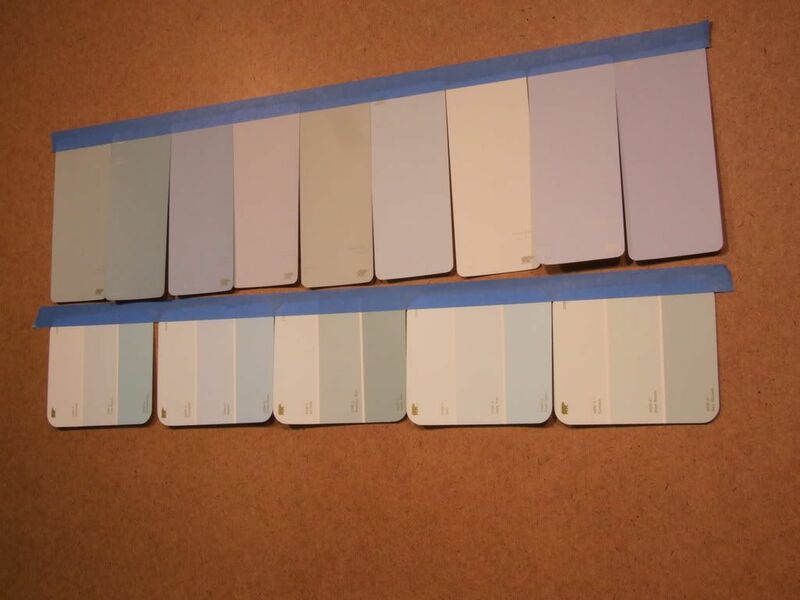 I got some paint samples and I am going to pick out a color that best looks like a hazy Appalachia ski so I can get the back drop painted a basic color until the scenery base gets in, then I will go back and paint details on it when I know better what the scenery will look like. If I may, I suggest that you paint primer on the raw masonite before you go and paint the base backdrop colour on. The brown of the masonite some times bleeds thru and you need more coats. "Kills 2" or dry wall primer works well. I really like your track plan, not alot of track just enough to keep you busy. I love the look of your loco on this very nice track, Jeff. Doing a damn fine job there Jeff, it is looking so good! Keep the updates coming. Do let us know what colors you decide on for your backdrop, I'm going to be needing the same for my new layout soon. Back in HO...and stayin there! Great progress Jeff, hand laid track looks awesome. thanks all. Little progress report, I have three of the five turnouts built for the staging tracks. I am in the process of laying the ties, by next week 3/4 of the loop will be operational. I had a request to show how I build my turnouts, the next one I build I will take photos along the way. 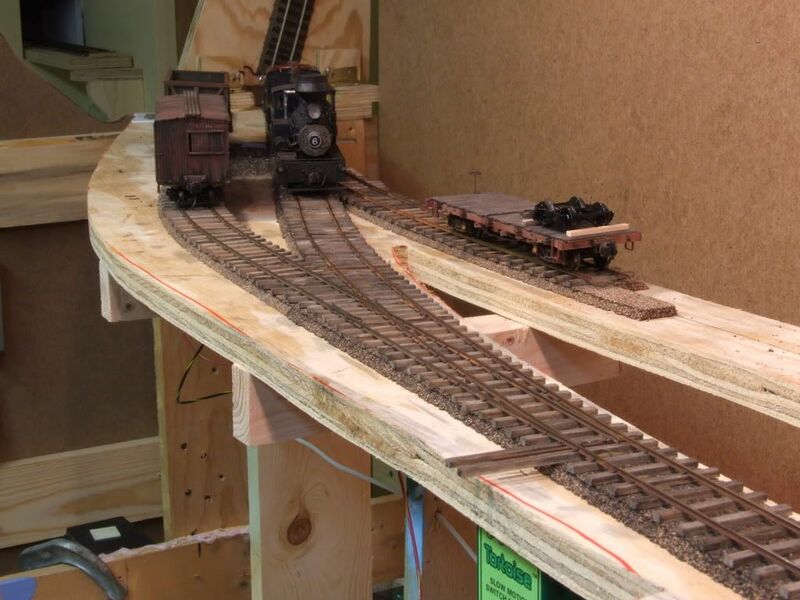 From the JT layout construction thread in the on30 forum. I don't know if individual tie plates are sold in HO scale.. because obviously O scale tie plates (Grandt Line) wouldn't fit. Would it be feasible to use N scale spikes? Also what code rail are you using? 83 or 70? I am using code 83 rail. I know, the spikes size bugs me. I have scale spikes but they are really a pain to install, maybe I will try it again. 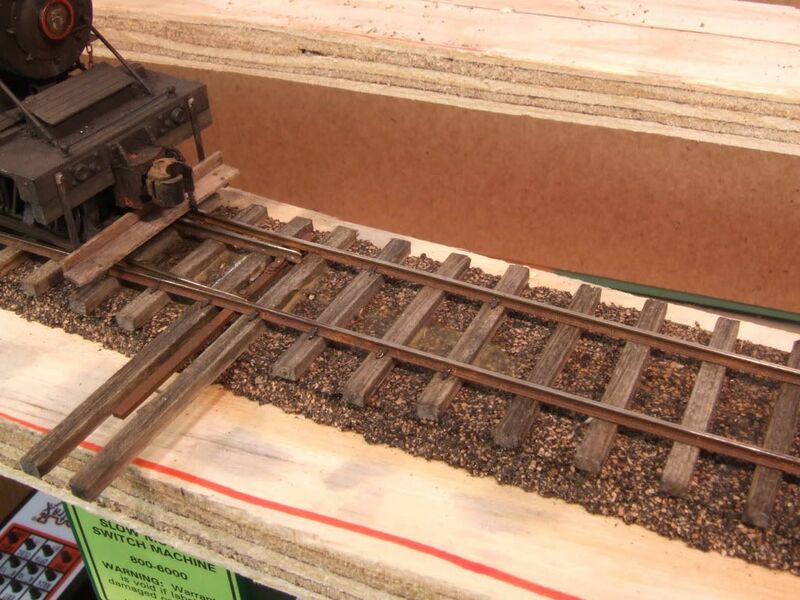 I know some narrow gauge railroads used tie plates but my prototype inspiration did not. Maybe it is how you install them? Let me know if you take another stab at it. The more I look at my handlaid code 83 spur, the more I want to rip out the other tracks and redo it all and do it the right way. There has got to be a tool out there that can handle those tiny spikes. Perhaps we could confer with those who handlaid N scale tracks and ask them what their secret is. I tried them again, they sure bend easy and they do not have any holding power, I think the last time I used them I dipped them in ACC before I pushed them in. Maybe if I predrill a holes it would be easier to install them. they sure look good. HO tie plates are available, from the Proto87 people at least. I've also tried simulating them using paint, and like the results-to-work ratio. 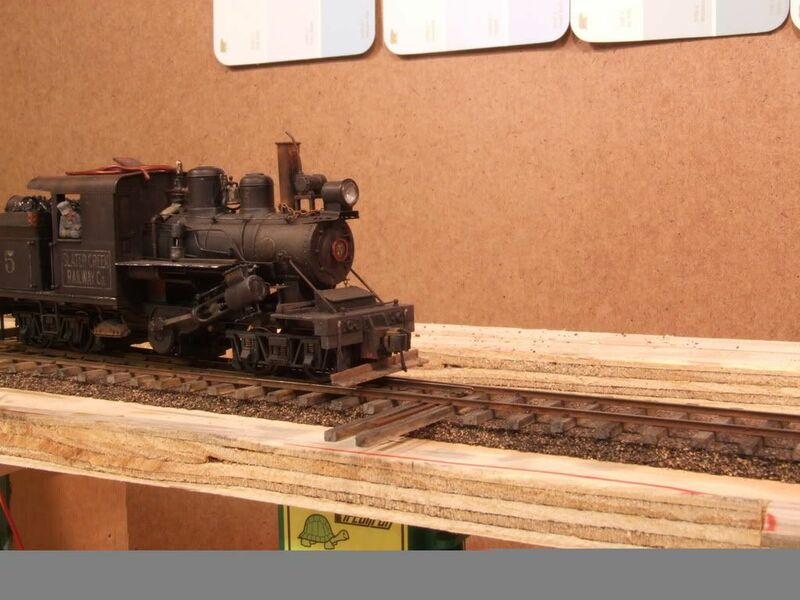 I posted a couple of photos on the NMRA Model RR Civil Engineer thread under "Construction" a while back. In photos and visits to the old D&RGW, I've observed that tieplates were often skipped as an unnecessary expense on logging and mining railroads. I handlaid some code 55 using Micro-Engineering's "micro" spikes and bent a lot of them. When I used them in my switch for the AP, I tried drilling and didn't bend any. 4 per tie will hold ok due to "strength in numbers", unless you use an oversize drill.